Fenugreek seed (Trigonella foenum-graecum) is an annual Mediterranean and Asiatic herb with aromatic seeds. It is used world wide as a culinary spice and now well recognised as a concentrated herb in a capsule for soothing the stomach and to digest food. The seeds of Fenugreek contain the most potent effects of the plant that are a rich source of dietary fibre and this may contribute to the many properties of health that Fenugreek is useful for. It contains natural antioxidants, vitamins and minerals. 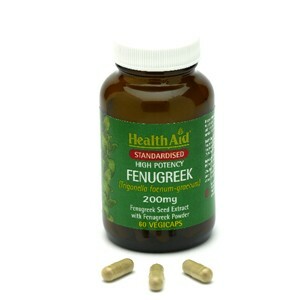 Thank you for your interest in HealthAid Fenugreek 200mg - Standardised Capsules . Enter your email and we'll contact you as soon as it's available again.